I always try to provide honest and balanced reviews here on Bows & Pleats, and I hope that is a reason why many of you are return visitors! 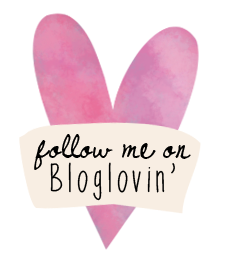 I was looking through some of my latest posts and realised there have been lots of positive reviews, mainly because I love reviewing and sharing products that I genuinely love with you all. However, sometimes it's good to see thing from the flip side and let you know that many products don't work for me! 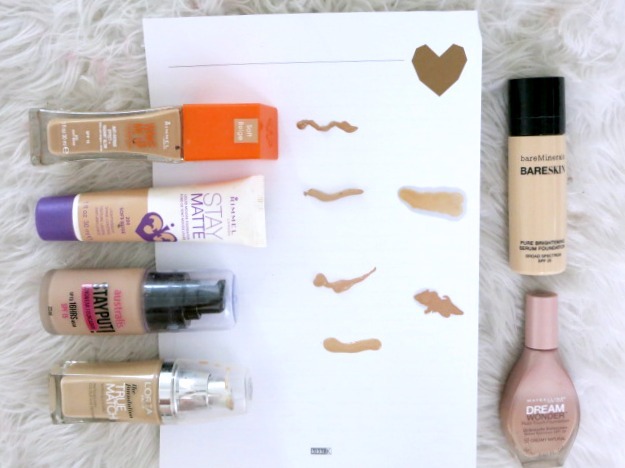 I especially struggle with finding foundations to suit my combination skin. I get oily in my t-zone but can be dry on other parts of my face so finding a foundation that meets all my needs isn't an easy feat. 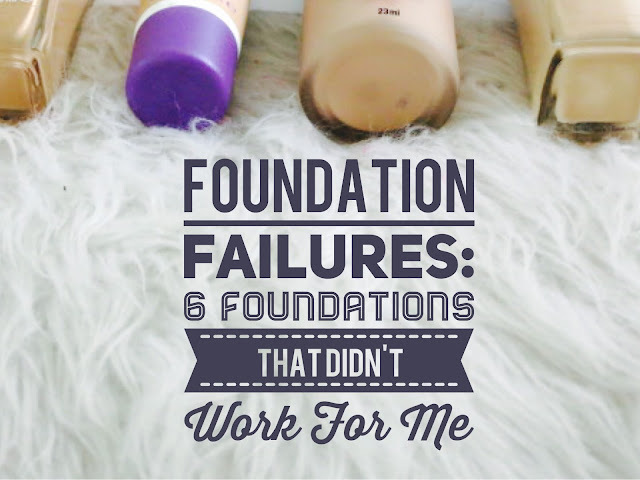 Today, based on your votes from Instagram I am going to be taking you through 6 foundations that just didn't work for me and why! I just want to start this post by reiterating that just because these foundations didn't work for me, doesn't mean they won't work for you. I just thought it would be worthwhile sharing my negative experiences with these products in case you might be thinking of trying any of these so it can assist you in making your decision or adding to your own research. 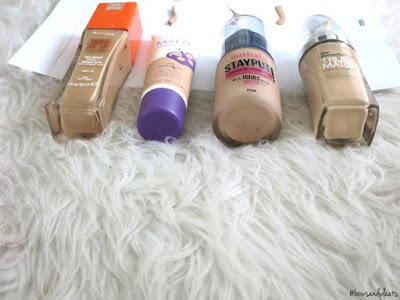 I have tried all of these foundations over several months with different moisturisers and primers in order to thoroughly test them out and give you my honest feedback and criticisms. The main things I look for in a foundation are that they have good coverage - even if they provide lighter coverage, I don't mind as long as it is buildable but I generally prefer medium to full coverage. I like for the foundation to feel and look natural on the skin and blend out easily. It's okay to notice you are wearing makeup but you don't want to look like you are wearing a mask. I like a variety of finishes. I'm sad to add this one to the list because I absolutely love the way this foundation looks on my skin when it is first applied. 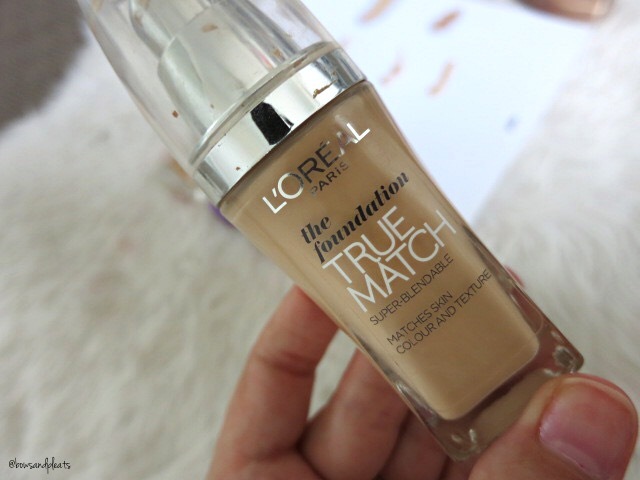 It gives a lovely medium coverage and feels very creamy and hydrating on the skin leaving a dewy, glowy look. BUT ... after a few hours of wear I find this foundation just breaks down on me and slides around even after setting it with powder. It also oxidises quite badly and starts to look orange after a few hours. The formula contains shimmer, which is part of the reason why it makes the skin look youthful and glowy but some may also dislike this aspect since it is more noticeable as the foundation wears throughout the day. I can't even get away with wearing this to work because it makes me very shiny in the t-zone and I need regular touch ups with powder to maintain this throughout the day. It also begins to feel quite heavy on the skin and I just want to remove it after I've worn it for 5-8 hours. I wanted to like this one but there was just too many things going wrong with the formula for me to make it work. I don't mean to be a bully here, but here is another foundation from Rimmel that just missed the mark for me. This one had such great promise, since the coverage is absolutely phenomenal and I didn't even need concealer when using this HOWEVER promises of a smooth and silky texture that doesn't feel heavy on the skin definitely did not deliver. This foundation is extremely thick and does not blend out well. It feels very heavy to me, even when you only use a small amount and I found it had a tendency to cling to any dry patches that I had at the time. Whoever wrote "lightweight" on the bottle must not have ever tried this formula. I tried applying this many different ways including a damp beauty blender, applying a moisturising primer or even mixing in a little illuminator to break down the heavy formula but nothing worked and I always ended up with cakey looking makeup. Not cute. 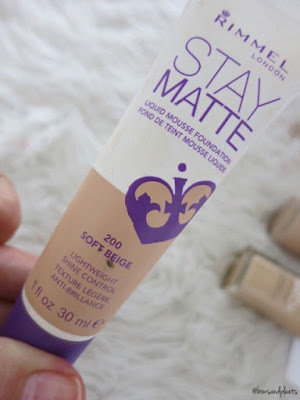 I've already done a full, in depth review of this foundation just over a year ago which you can read here. I originally gave this 3/5 bows, mainly because the longevity of this foundation was very disappointing. It only lasted about 4 hours on me before powder touch ups were needed, even after originally setting it with a powder! The more I use this, the more I find it too heavy for my skin and the "longwearing" name just does not deliver. This also promises to be smudge free but I found that it transferred really badly onto my phone throughout the day so it is difficult to set. There are definitely better drugstore alternatives out there. 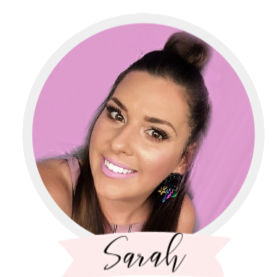 I am sure some people will disagree with me on this one as it is a drugstore cult favourite, and was even highly recommended (HG status) by well known Australian Beauty Guru Lauren Curtis for a while there. This foundation is a true matte finish and I feel like when I wear it my skin looks very flat and dull. It provides extremely full coverage and I find that it can at times look cakey on me. I don't think this foundation is horrible, but it doesn't work for me. I just always find myself mixing it with L'Oreal Lumi Magique to add some glow and freshness, or mixing in an illuminator so it looks less heavy and more natural. I definitely don't think this one is worth the hype it receives. I'm pretty sure I picked this up when Brittany Saunders was talking about how much she liked it in one of her videos and I decided to try it out. The formula was surprising to me as it is extremely thin, runny and liquidy. The plastic wand applicator is designed to apply foundation directly to the face, however I applied mine to the back of my hand and used both a foundation brush and beauty blender to apply. I hated the packaging for this and would have preferred a pump or a proper dropper. 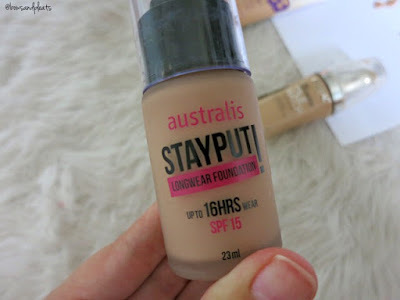 I found that this foundation provided very little coverage and applied quite patchy on me, clinging to fine lines, dry areas and any uneven skin. It was difficult to set and just felt very greasy on the skin. 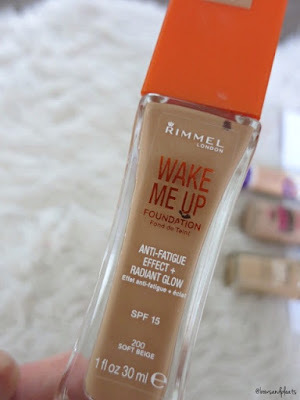 I've read a lot of mixed reviews on this foundation but it is definitely on my miss list. Another sight that makes me so sad, mainly because this is a higher end foundation that really disappointed me and I had very high hopes and expectations for this one. I purchased this when I was in Sephora overseas last year and I was so excited to try this out. 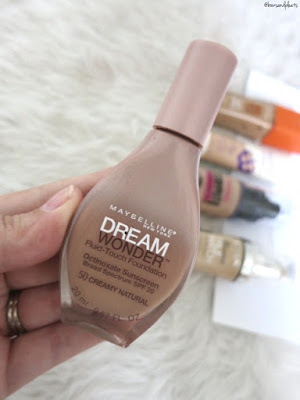 It has a very similar consistency to the Maybelline Dream Wonder Foundation mentioned above, it is also very thin and runny but has a better applicator so you can squeeze the bottle and drop out the foundation directly onto your hand or brush. I even bought the special brush that goes with this foundation which I also did not like or find very useful. I loved how this looked when it first applied, quite natural and a "your skin but better look" however it just seemed to settle into my fine lines and crease quite badly. 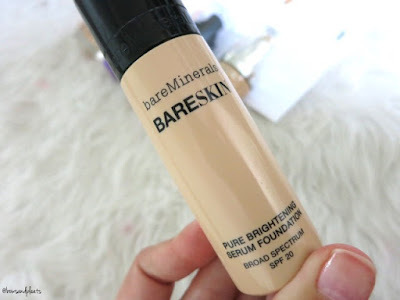 When I was trying to build up the coverage to cover up my redness and even out my skin, I found the foundation went streaky and patchy and would not work no matter what I tried. I expected a lot more for a higher end foundation and I was sad that this just didn't work! Well, I hope you got some useful information out of this post! I always read lots of reviews before purchasing a new foundation, and even then the product sometimes does not work for me. When it comes to foundations, remember that everyone has different things that they like and dislike, and everyone's skin is quite different! What is a foundation that just doesn't work for you?